The Venetian Riviera is the sandy coastline along the Adriatic Coast in the immediate vicinity of Venice and has been attracting visitors for generations. 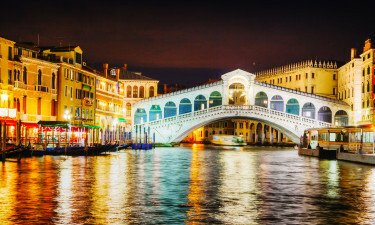 Holidaymakers have it all on the Venetian Riviera; deep blue waters of the coastline, superb beaches, and the dazzling city of Venice as a backdrop. LUX-camp offers family camping luxury in a breathtaking setting for you and action-packed adventures for the youngsters. Book your family into a LUX-camp luxury holiday camping site next summer. We know the Adriatic Coast! A camping holiday by the Adriatic Coast will offer you some of the best beaches in Italy, an exciting history and beautiful cities. All of our advisors have visited most of the campsites by the Adriatic Coast. Therefore, they can give you a personal and professional counseling. Find and book your next camping holiday by the Adriatic Coast online or contact one of our advisors at tel. 01 437 8555. Why choose a camping holiday by the Adriatic Coast? Venice, known as La Serenissima, the most serene, is built on 100 little islands in a lagoon. The Venetian Gothic palaces rise seemingly magically from the water along the Grand Canal. The single form of transportation within the city is on foot or by boat. The labyrinth of canals that weave through the city has necessitated the building of more than 400 bridges to accommodate the foot traffic. Over centuries, Venice developed into an immensely powerful republic by controlling the trade routes along the Adriatic Sea and subduing rival states. Venice has not changed much over the past 500 years and the original stone buildings are in remarkably shape considering that the floating city has been threatening for some time to sink back into the sea. The oldest film festival in the world is held every year in August and September on the Lido. Visitors are increasing opting for a luxury camping site along the coast as a springboard for sightseeing along the Venetian Riviera and Adriatic coast. If your holiday goes to the Adriatic Coast this year, you cannot miss out on a day-trip to this amazing historical city! 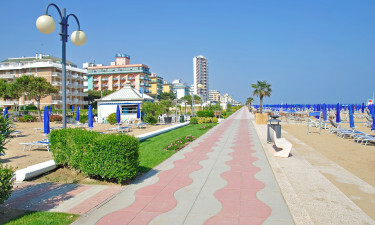 Marina di Venezia is at the seaside resort of Cavallino. Luxury camping includes a choice of mobile homes. Along with onsite secure playgrounds for children, complete aquatic complex and complete set of sports facilities, the site also offers sailing, wind surfing and kite surfing. You can catch a ferry boat to Venice or another lagoon island at a harbour nearby. Pra’ delle Torri is at Caorle, a relaxed and prettily-painted fishing village north of Venice. In addition to the usual fully-equipped sport facilities for adults and children, the 120 hectare camping grounds include an 18-hole golf course with instructors and aquatic complex are right on the seafront. The accommodation is a luxury mobile home which can take in whole families. Union Lido is the ultimate in camping luxury with 1km of private beach, a full spa and an 8-pool water park, plus the excellent sporting and entertainment facilities that are standard at LUX-camp sites. Accommodations are various types of mobile home, all with complete amenities. Supervised children’s play groups are organized by age and include a variety of arts and sports activities.